Published on August 1, 2017 in Africa, Caribbean, CARICOM, England, General T&T, International and Politics. 5 Comments Tags: Emancipation Day, Newsday, President Anthony Carmona, Reparations. 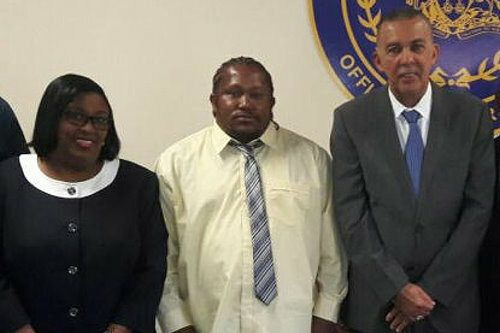 PRESIDENT Anthony Carmona yesterday publicly supported a call to have European governments, whose countries benefited from slavery in the West Indies, to pay reparations to the descendants of African slaves. In his Emancipation Day message, Carmona said TT should support the efforts of Caricom governments as expressed by Sir Hilary Beckles, Vice-Chancellor of the University of the West Indies and Chairman of the Caricom Reparations Commission, in an address to the British House of Commons on July 16, 2014. Published on July 8, 2017 in Crime in T&T, General T&T, Media, PNM and Politics. 1 Comment Tags: Cedric Burke, Crime in T&T, Keith Rowley, MP Marlene McDonald, President Anthony Carmona, T&T Govt. Prime Minister Dr Keith Rowley has admitted that the Housing Development Corporation may have no choice but to allow Sea Lots community leader Cedric Burke to complete the contract he has on a development in Bon Air, Arouca. He also admitted his Government did not undertake due diligence in appointing the board of directors of the East Side Plaza and New City Mall, Port-of-Spain.